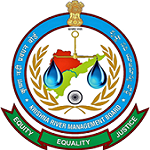 1)	What is Krishna River Management Board (KRMB)? The Andhra Pradesh Re-Organization Act, 2014 was promulgated in Parliament by the Central Government for the bifurcation of the erstwhile State of Andhra Pradesh into the States of Andhra Pradesh and Telangana, and under the Presidential Orders, Ministry of Law and Justice published the Act vide Gazette No.6 (part-2) of 2014 on 1st March 2014. Part IX of the Act deals with Management and Development of Water Resources of the successor States. In exercise of the powers conferred under section 85 (part IX) of the Andhra Pradesh Re-Organization Act, 2014, the Central Government constituted KRMB for the administration, regulation, maintenance and operation of such projects, as may be notified by the Central Government from time to time. 2)	What are the main functions of the KRMB? (e) such other functions as the Central Government may entrust to it on the basis of the principles specified in the Eleventh Schedule. 3)	Who are the members of the KRMB? 4)	Who is the funding authority of KRMB? According to the ANDHRA PRADESH REORGANISATION ACT, 2014, the Government of the successor States shall at all times provide the necessary funds to the Board to meet all expenses (including the salaries and allowances of the staff) required for the discharge of its functions and such amounts shall be apportioned between the States concerned in such proportion as the Central Government may, having regard to the benefits to each of the said States, specify. 5)	What is Apex Council? According to the ANDHRA PRADESH REORGANISATION ACT, 2014 under clause (1) of section 84, the Central Government shall, on and from the appointed day, constitute an Apex Council for the supervision of the functioning of the Krishna River Management Board. (c) Chief Minister of State of Telangana-Member. 6)	What is the water sharing ratio between Andhra Pradesh and Telangana? As per the Krishna Water Dispute Tribunal Award, the erstwhile Andhra Pradesh State was allocated 811 TMC (800+11 TMC return flows) of water at 75% dependability. Consequent upon division of the erstwhile Andhra Pradesh as per Andhra Pradesh Re-Organization Act, 2014 into Telangana and Andhra Pradesh, a meeting was held on 18th & 19th June, 2015 at New Delhi under the Chairmanship of Additional Secretary, MoWR, RD & GR with officials of the States, KRMB and CWC. In the meeting, with the consensus by both the States, a decision in respect of distribution of water (811.0 TMC) has been taken. Accordingly Telangana may utilize 298.96 TMC and Andhra Pradesh may utilize 512.04 TMC. Shortage or excess is to be shared in the same ratio. It was also agreed in the meeting that the figures of share of the two States may be followed as working arrangement for the year 2015-16 only. During the 1st meeting of the Apex Council held on 21-09-2016, it was further agreed by both the States for continuation of 2015-16 working arrangement for sharing of waters for the year 2016-17. In the 7th meeting of Board held on 04-11-2017, after detailed deliberations and with the consensus of members from both the States, the Board decided to share the Krishna water enbloc in the ratio of 66:34 (excluding Godavari diversion and Minor Irrigation) for Andhra Pradesh and Telangana respectively during the Water Year 2017-18 only. The other conditions as mentioned in the minutes of the meeting held on 18th - 19th June, 2015 in MoWR would remain same. 7)	What is the power sharing ratio between Andhra Pradesh and Telangana? The Andhra Pradesh and Telangana States have agreed to release water from power house of Srisailam to derive power benefits in 50:50 ratio. 8)	Who are the Central Public Information Officer (CPIO) and Appellate Authority of KRMB as per Right to Information Act, 2005?